Masterpiece Penthouse living! This sundrenched and unique gem designed by Annabelle Selldorf is surrounded by oversized windows and a large wrap around terrace with stunning open city views to the North East and South, creating excellent natural light all day long. 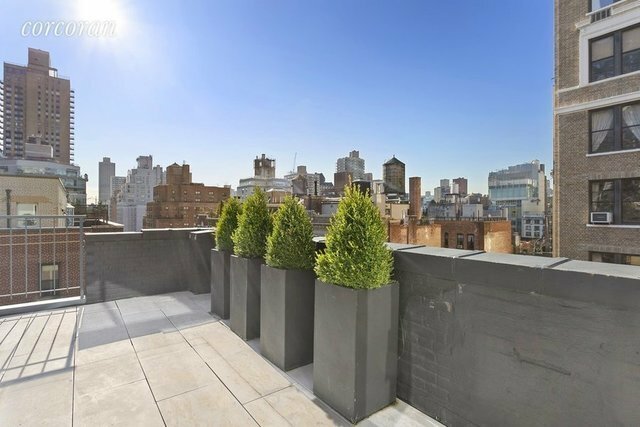 Perched atop an elegant Emery Roth building, this mint condition penthouse has it all. The highest quality materials were used in this 2 bedroom apartment (or 1 bedroom + den) including Carrera marble in the custom kitchen, heated floors in both full bathrooms, and a 2 sided floating gas fireplace that separates the 2 rooms. The glass enclosed conservatory can be used as a den or a dining room and has direct access to the beautifully landscaped large terrace. There is great storage throughout the apartment. Other features include custom closets, central AC, and Bowers Wilkins speakers. 103 East 84th St. is an elegant pet friendly, full service cooperative with a resident building manager and superlative staff. Large double storage is included and Pied a terres are allowed!